Querari’s son Head Honcho demonstrated that attribute so prized in a thoroughbred, courage and tenacity, when he registered his first Graded success in Greyville’s Gr.3 Betting World 2200 on July day. With no pace on, jockey Keagan de Melo boldly sent Sabine Plattner’s homebred to the front fully 1000m from home and that is where he stayed. Two lengths clear at the top of the straight, the four-year-old was still full of running and although hotly challenged by last year’s winner Crowd Pleaser over the final 150m, Head Honcho tenaciously stuck to his guns and in a thrilling, no-holds-barred duel, kept finding that little extra to win by the bob of a head. The pair was followed across the line by Black Minnaloushe’s three-year-old Blackball, who picked up his first black type here. Remarkably, Head Honcho’s victory mirrored that of the Listed Sledgehammer back in April, when he unflinchingly took up the challenge as the Gr.1 Cape Derby third Pack Leader came at him hard over the final furlong to hold on for a short head win. Pack Leader was a well-beaten fourth here. Now a six-time winner boasting earnings of over R730,000, Head Honcho is out of Gr.2 Odessa Stud Championship runner-up School Captain (Captain Al), from the female line of champion juvenile and sire Fasliyev and the American Gr.1 winners Desert Wine and Menifee. Head Honcho was just one of a quartet of winners on the day for Querari. His three-year-old son Kazaar, foaled and raised at Maine Chance on behalf of former stud manager John Slade, made it back-to-back wins by taking the eighth race. Remarkably, his close relation Barahin had earlier captured the Gr.2 Durban Golden Horseshoe. Both share John’s remarkable mare Mabola Plum as their grandam, Kazaar being out of Mochalette, whose half-sister, the Silvano mare Mocha Special, is the dam of Barahin. 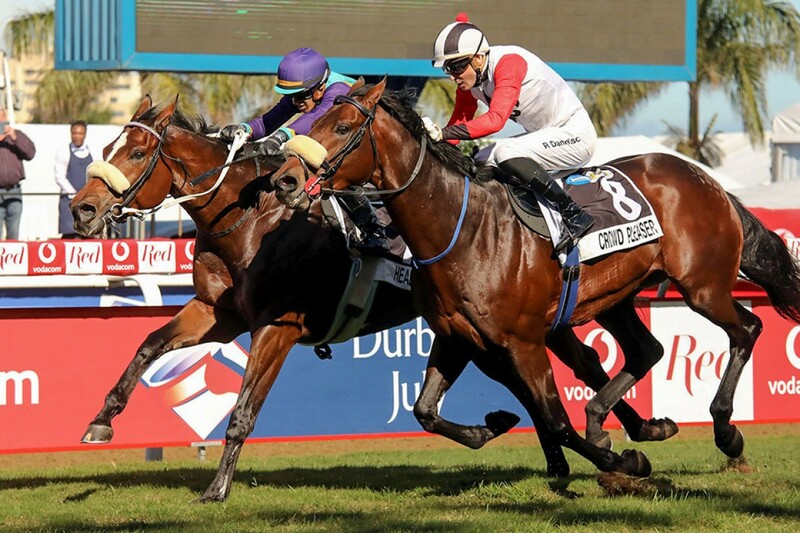 Procal Harum completed the Querari trifecta with a fluent victory in the subsequent eThekwini Sprint, defeating a classy field headed by smart Cape sprinter Dutch Philip. Maine Chance-bred daughter and Ruffian Stakes heroine Dagmar rounded out her sire’s quartet when she regained the winning thread at Turffontein, going 1400m for the first time. Amongst the vanquished was hot favourite Return Flight, who had ripped through her last two starts by almost 20 lengths.